Is ERP Success Really Such a Secret? ERP isn’t just big business, it’s huge business, projected by those who know to break $50 billion yearly by 2015 in software sales, maintenance, development, and services. Thousands and thousands of companies undertake ERP investment and implementations yearly. There are millions of pages on the Internet about how to make ERP projects successful. And hundreds of firms and thousands of people exist whose life-blood is implementing ERP solutions. So why does ERP so often fail to deliver? According to some, you’ve got a fifty-fifty chance to satisfy half of your goals for the investment. So, if I plan to drive to Dallas and only get half way there, is that a successful trip or a failure? I may have enjoyed the journey while it lasted, but then I ended it in Abilene, not Dallas. That is not a successful trip. It is a sure ride to the Desert of Disillusionment. Failing to deliver the desired business value means the project was a failure regardless of whether it was on-time, on-budget, or on-scope. It failed. Let’s hear that again. It failed. Sure, everyone got to keep their jobs because the project concluded reasonably close to the schedule and within some allowable contingency of the targeted budget. Success, right? Well, not if you wanted to get further it isn’t. It failed. How can that possibly continue to happen? The ERP landscape is enormous. Almost every business – particularly those involved in manufacturing or distribution – use or want to use ERP software. Certainly people know better. There are thousands of really experienced, smart people guiding and informing these projects, yet they continue to fail to deliver fully against expectation and goals. Is the problem that goals are too high? I sincerely doubt it, as companies engaging in ERP projects rarely agree to document their goals in writing or in measurable ways, paying only lip service to “productivity gains” or “improved efficiency”. So if the goals aren’t the problem, what is? You can read for years about better project management, better leadership, a better implementation process and still miss the boat. The bottom line is simply this: software does not drive a business. People do. And if you don’t empower and support people, all the technology in the world won’t move your business forward. This is something we’ll explore further in subsequent posts. 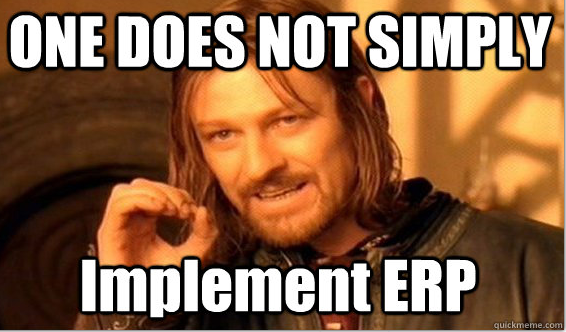 But stay tuned as we drill into how to turn the discussion on ERP success on its head. This entry was posted in Business, ERP and tagged Change Management, Enterprise resoure planning, ERP, transformational change. Bookmark the permalink. Having worked with ERP software over three decades it appears to be the most lagging platform I can think of. While I can do just about everything on my phone (with ease) from order a pizza to map a route anywhere in the world. Most ERP software is slow clunky not intuitive or user friendly and takes a army of programmers to make minor changes. Most software today is geared toward the user except ERP software. ERP software demands user to conform to it. I can clearly perform eCommerce or post a you-tube video without asking what T code should I use? ERP catch up with the rest of the world.